1. One of the most prominent figures of Chilean separatism was an Irishman. Bernardo O'Higgins’s façade is featured on the not-so-valuable 10 peso coin (1 US Dollar = 630 Chilean Pesos). 2. It's good to be the Chilean government when nationalized copper sells for $360/ton but not so good when copper is $125/ton. 3. The semi-precious blue ‘rock’ Lapis Lazuli, found in Chile and other places, was believed by the Romans to be a powerful aphrodisiac. 4. Quinoa is plentiful in northern Chile (lucky for me). 5. Chile is as tall as America is wide. It’s 2,900 miles from top to bottom but ONLY 260 miles at its widest point east to west. 6. From an airplane the topography of the Atacaman Desert looks like spilled coffee, a bank blueprint, and Da Vinci's Vitruvian Man all at the same time. 7. Flamingos like to hang out around salt. 8. The best racket in San Pedro is the one guy who sells camera memory sticks. 9. Almost all the Chileans I spoke with seemed cautious about expressing their political views on Allende vs. Pinochet. By my count the country is split right down the middle. 10. Rica Rica is an altiplanic medicinal herb reminiscent of rosemary with a citrus twist. The herb makes a fantastic base for tea or supplement to water and certain juices. 1. Antiques in Buenos Aires are dialed back 25 years and priced 50% cheaper than in New York. 2. Argentineans claim that their real currency is the US Dollar but mysteriously no one seems to keep track of the exchange rate. 3. Argentineans are PROUD of their European genealogy. 4. Mariano Cid de la Paz’s deconstructed empanada is not as good as the real thing. 5. Never trust an Argentinean Greek whose teeth are three-quarter rotted. 6. 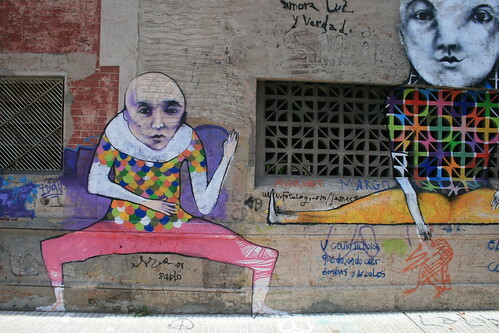 There is a political / financial calamity in Buenos Aires every 10 years. 7. The famed Argentinean parilla (grilled meat) isn't all it's cracked up to be. 8. I took street signs for granted until I walked through the outer neighborhoods of Buenos Aires. 9. MTA fare hike haters should move to Buenos Aires where a one trip is only 25 cents. 1. Jack Johnson’s widespread popularity is troubling to say the least. 2. There are still places in the developed world where a pack of 16 year old girls can hitchhike at 3am. 4. Many Nightclubs in Punta Del Este OPEN at 2am. 5. In Montevideo housecleaners charge USD $1 per hour yet a 20km taxi ride in Punta Del Este will set you back USD $50. 6. Uruguayans think Argentineans are full of themselves. Argentineans think Uruguayans are unintelligent and insignificant. 7. I'd feel more convinced that Duty Free was a legitimate value proposition if the salespeople weren't the most attractive residents of their respective countries. 8. There are zero people of Far Eastern descent in South America. 9. Cab drivers ALWAYS wear their seatbelts. 10. 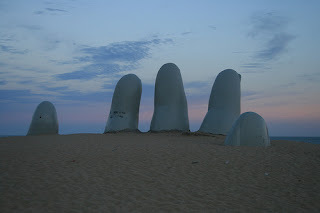 Mario Irrarazabal’s LA MANO (The Hand) sculpture should be gifted to the Argentineans and re-named LA MANO DE DIOS (The Hand of God) themed to commemorate Maradona’s fraudulent goal in the1986 World Cup quarter final match vs. England. Point #6 will likely prevent this from ever happening.